Clarion International Ltd. (brand name Clarion Energy) (www.clarionsrilanka.com) has been in the forefront of green technology offering energy saving solutions to over 1,300 leading Sri Lankan companies for almost three decades. It has contributed towards saving billions of rupees for those companies in the process. Clarion Energy partnered with ABB, pioneering world technology leader employing over 120,000 globally, to conduct “It’s all about saving your money” workshop at the BMICH recently. ABB is the world No. 1 in VSDs (Variable Speed Drives) for various applications to achieve optimum power saving and most flexible operation to suit most applications with minimum external components. The BMICH workshop was attended by around 65 personnel comprising CEOs, senior managers, senior engineers, and factory managers in a cross section of 42 local companies that deal in varied businesses. The workshop emphasised on four main areas; Energy Efficiency, Operation and maintenance, Energy conservation and Renewable Energy. 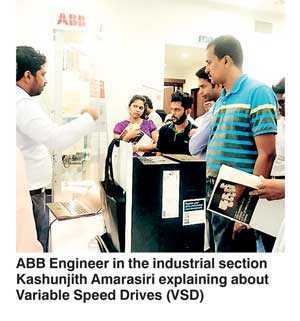 ABB representatives, Assistant Sales Manager Lakmal Silva and Engineer Kashunjith Amarasiri explained the products at the workshop. They did demonstrations to show the participants and stated that only 30% of business entities and factories in Sri Lanka currently make use of VSDs to save and conserve energy at their businesses, though it can be easy installed. Clarion Energy currently offers energy saving solutions to over 50% of the ‘TOP 1000’ Sri Lankan companies. They include Sampath Bank, Brandix, MAS Holdings, Central Bank, Ceylon Cold Stores, Aitken Spence, Hayleys, Richard Peiris, Kandalama, Taj Samudra and Fortress hotels, Nestle, Unilever, Ansel Lanka and Asiri, Central, CECB, Nawaloka, Hemas, Durdans hospitals, over 100 plantation factories. Clarion Energy COO Kishow Mahendran explaining more about energy conservation to participants of “It’s all about saving your money” workshop said, Clarion Energy has contributed towards saving energy worth billions of rupees for over 1,300 leading Sri Lankan companies for more than three decades. He added, “Energy conservation solutions can be adopted in stages to reduce the burden on the company’s budget. Also Clarion Energy has now launched a program to save the huge costs spent on energy audits too: a flexible and an affordable ‘model’ where consultancy costs would be zero. The benefits of adopting these solutions are; Company increases its profits and derives respect from the international market as a ‘Green company’. Further, ‘Greening Process’ makes your products more attractive to foreign buyers who are becoming more demanding in environmental friendly production methods. Also the share value of the company will improve”. With the payoff line, “Greening the Nation Since 1986” for over 32 years the Clarion Energy has contributed towards ‘Greening Sri Lanka’ more than any other registered ESCO company. Clarion International has been recognised by leading banks, state institutions, multinational companies, super market chains, tourist hotels, private hospitals, apparel industry, agro-sector, pharmaceutical sector, Food and Beverage sector, etc. as a ESCO supplier who has saved energy by billions of rupees via providing state-of-the-art energy solutions. Lightning protection and surge protection systems for Ruwanweliseya, Abhayagiriya and Jethawanaramaya stupas in Anuradhapura too have been installed by the Clarion International Ltd.
Clarion Energy imports equipment only from specialised global leaders such as; ABB – a multinational for VSDs, FRAKO – Germany for power capacitors and energy management systems, WEG – Brazil for high energy efficiency motors, HAKEL – Czech republic, Europe for surge protection, BENEDICT – Austria for power control components, LUVATA – Malaysia for Earthing networks and Bus-Bars and FRANKLIN FRANCE in France for lighting protection.